Every time I knit a sweater from the bottom up I have a moment of stupidity. It comes when I join the sleeves to the body and stupidly think, "I am practically done!" No, dumbass, you have about a third of your sweater left to knit. And not only that, it's the part that requires some thinking. So what this means is that even though I joined the sleeves and the body on Sunday I am only just now finishing the decreases. Then it's on to the saddles. I feel very confident that the sweater can be finished by the end of the Olympics. If I wasn't going on vacation. It will be a sprint to get the steeks sewn before I leave. Here's my giant lump of a sweater at knitting on Monday night. We're not in the photogenic phase of the project. 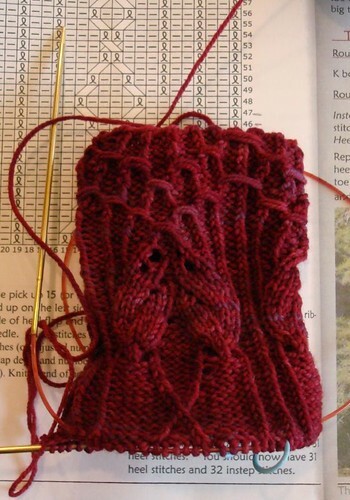 But one project that is extremely photogenic, completely beautiful and lots of fun to knit is Rivendell. It's a shop project knit in Smooshy. Love. Click for extra big and lovely.